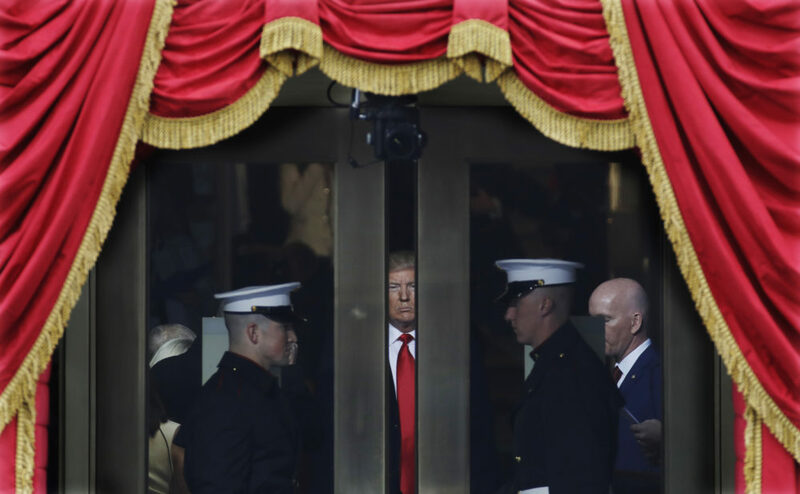 Donald Trump waits to step onto the portico for his presidential inauguration on Jan. 20. On Jan. 20, 2017, Donald Trump was sworn in as the 45th president of the United States. The real estate and reality TV mogul’s inauguration speech contained many of the same themes he had espoused as a candidate: taking power away from the political establishment and giving it back to the people; taking a tougher stance on crime, gangs and drugs; bringing jobs back to America; and, protecting U.S. borders. “This American carnage stops right here and stops right now,” he said. One of the first things the newly-minted president did was sign papers for his Cabinet nominations and proclaim Jan. 20, 2017 as a National Day of Patriotic Devotion. 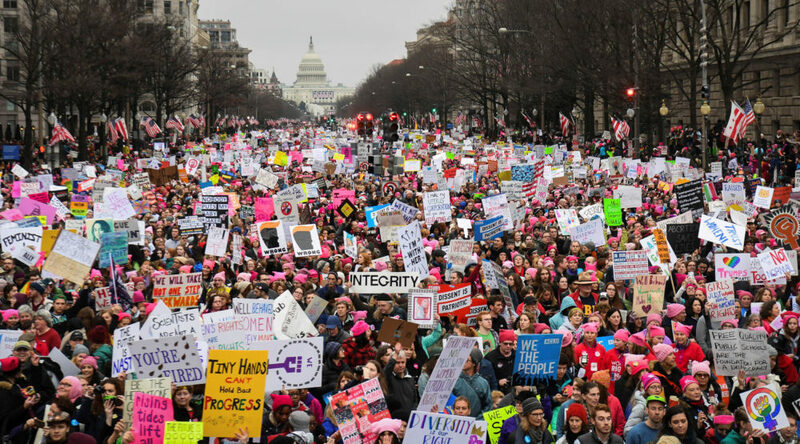 The next day Trump administration officials would claim that media photos of the event on the National Mall were framed to make it seem as though it was poorly attended. Hundreds of thousands march down Pennsylvania Avenue during the Women’s March in Washington, D.C., on Jan. 21. The day after the 2017 inauguration, hundreds of thousands of women descended on the National Mall and smaller groups gathered in other cities around the world to show resistance to Trump’s agenda and express support for women’s rights. The Women’s March on Washington was sparked by a Facebook invitation and planned in just 10 weeks. The rally that kicked the event off included speeches by Gloria Steinem, America Ferrara, Angela Davis, Ashley Judd, Madonna, Alicia Keys, Janet Mock and Amy Schumer. The organizing group developed a platform of positions and held a national conference in October that drew criticism when it was announced Bernie Sanders would be a speaker at the Detroit event. He decided not to attend the convention. White nationalists carry torches on the eve of a Unite The Right rally in Charlottesville, Va., on Aug. 11. 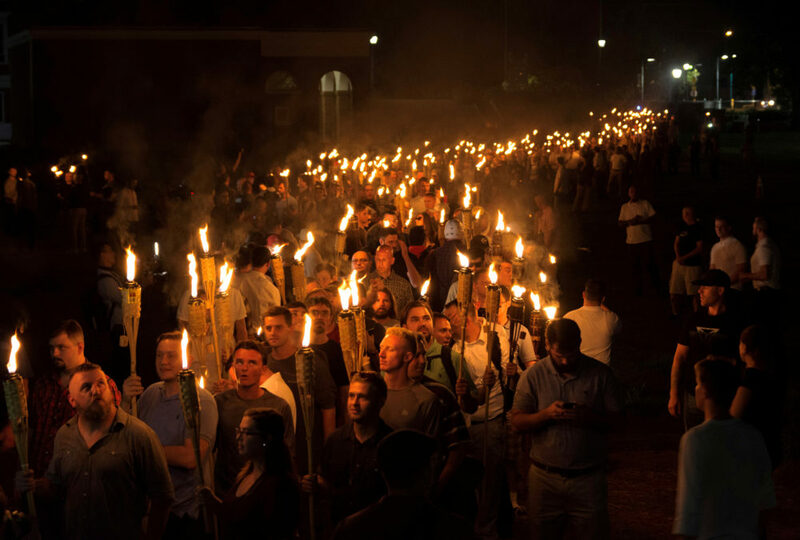 On Aug. 11, a group of white supremacists with lit tiki torches marched across the University of Virginia’s campus to protest the removal of a statue of Confederate Gen. Robert E. Lee. They chanted “you will not replace us.” Counter-protesters showed up and fights broke out between the two groups. This was foreshadowing for the violence that would explode at the next day’s white nationalist “Unite the Right” rally in Charlottesville. A car plowed into a group of people demonstrating against the rally, killing 32-year-old Heather Heyer and injuring at least 35 other people. The driver, James Alex Fields Jr., a self-professed neo-Nazi, was charged with first-degree murder earlier this month. 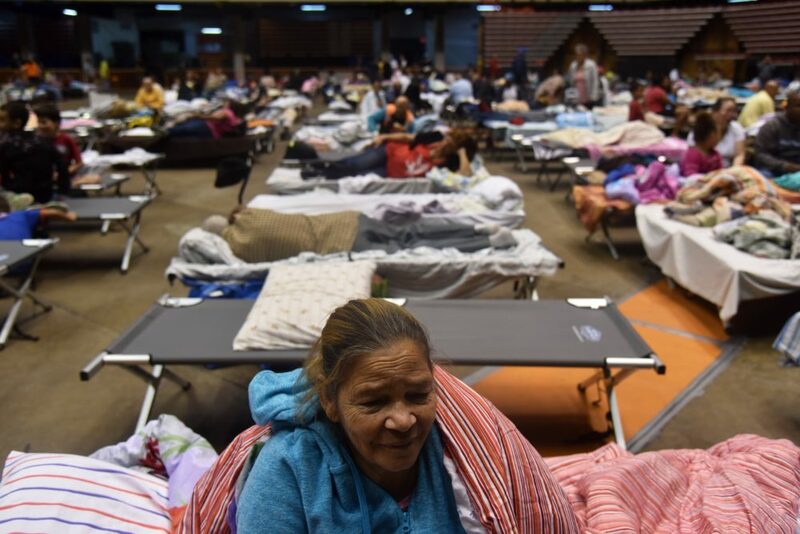 Puerto Ricans take refuge ahead of Hurricane Maria in the Clemente Coliseum in San Juan on Sept. 19. 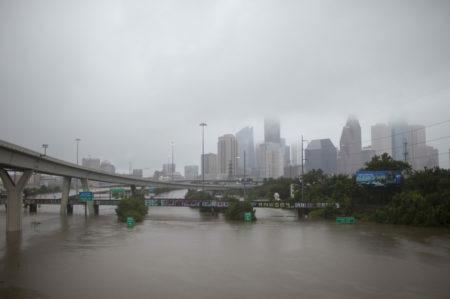 First, Hurricane Harvey dropped 60 inches of rain on Houston in August, which led to catastrophic flooding. The city is still recovering from the devastation and as of Dec. 21 had received $11 billion in federal disaster aid. Then Hurricane Irma — the world’s longest-lasting powerful hurricane or typhoon ever recorded — bore down on Florida, Puerto Rico and the Virgin Islands. Florida had received nearly $2 billion in federal disaster assistance as of Dec. 14. But, while Puerto Rico was still assessing the flooding from Irma, the island got hit, again, this time by Hurricane Maria. 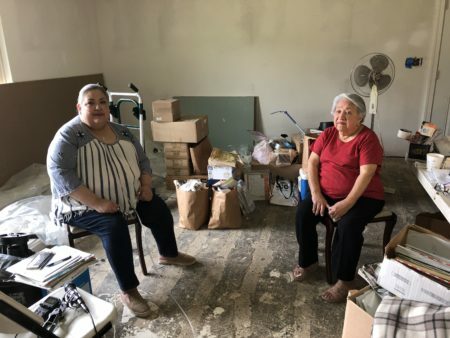 Now, much of the island is still without power and drinking water. The Trump administration has been criticized for its recovery response in the U.S. territory. 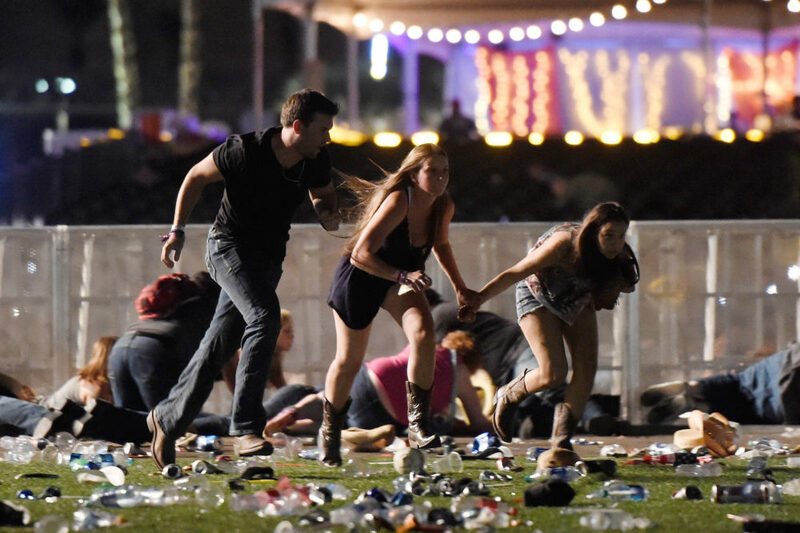 Concertgoers flee gunfire at the Route 91 Harvest country music festival in Las Vegas on Oct. 1. As more than 22,000 people shook and shimmied at the Route 91 Harvest festival concert on Oct. 1, a gunman positioned himself high above them in a room in the Mandalay Bay resort, then opened fire on the crowd. When the gunfire ended, 58 people were dead, more than 500 wounded and the shooter had killed himself. 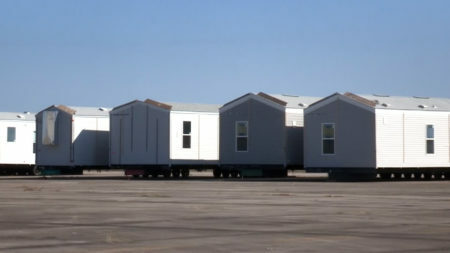 It was the deadliest mass shooting in modern U.S. history, surpassing the number of people killed in the June 2016 mass shooting at the Pulse nightclub in Orlando, Fla. Law enforcement officials are still unable to identify a motive for the gunman’s rampage and hundreds of victims are suingMGM Resorts International, owner of the Mandalay Bay resort; Live Nation, organizer of the country music festival and the shooter’s estate. The shooter’s use of a bump stock led Charleston, S.C., and the state of Massachussetts to ban the devices, which enables a semi-automatic rifle to fire more quickly. 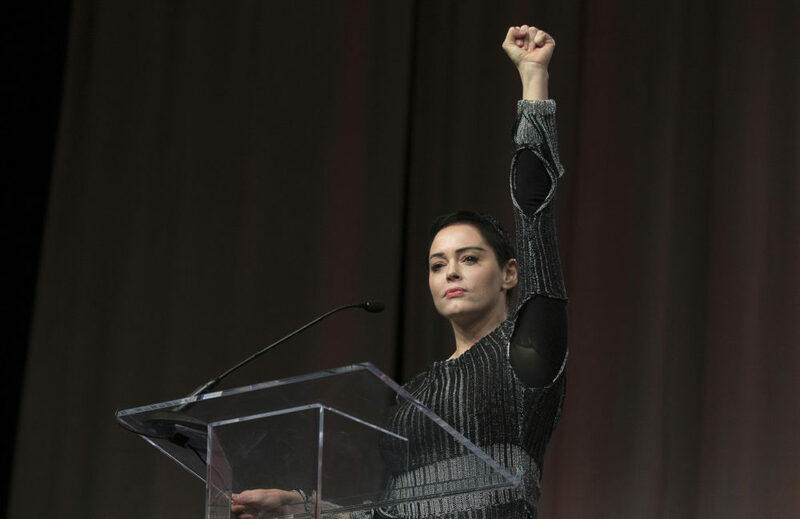 Actress Rose McGowan speaks at the inaugural Women’s Convention in Detroit, on Oct. 27. McGowan recently went public with her allegation that film company co-founder Harvey Weinstein raped her. As the number of sexual assault and harassment accusations against Hollywood producer Harvey Weinstein grew over the first weeks of October, a hashtag started trending on social media: #MeToo. Activist Tarana Burke launched the “Me Too” movement 10 years ago, as a way to help survivors of sexual abuse have a voice. Now, people around the world were using the hashtag to underscore how pervasive and damaging sexual abuse is for women. Once #MeToo picked up steam, more women started coming forward with stories of harassment and assault, and titans of media, entertainment and politics have been called to account. As a result, the movement was named Time magazine’s Person of the Year for 2017. 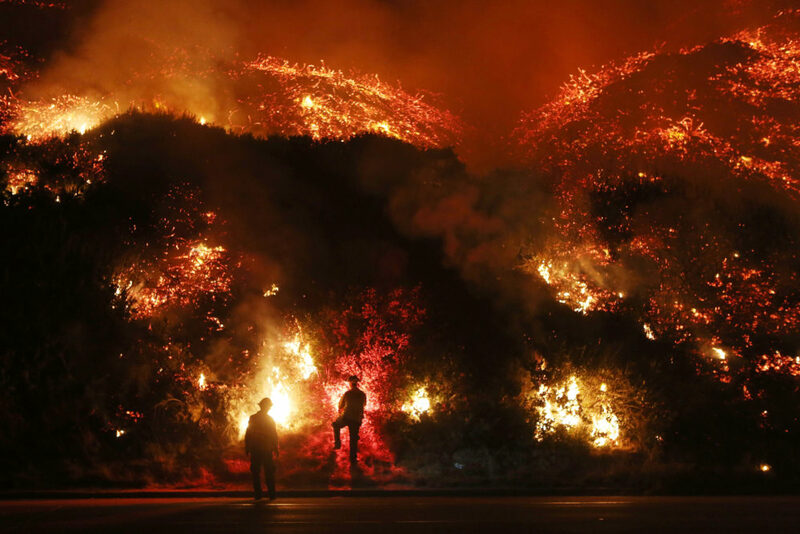 Firefighters monitor a section of the Thomas Fire along the 101 freeway, north of Ventura, Calif., on Dec. 7. On Oct.8, one of the worst fire seasons on record erupted in California. Seven wildfires swept across Northern California, killing at least 44 people and destroying nearly 9,000 homes and other buildings. The fires weren’t fully contained until the end of October. It is now the deadliest wildfire in the state’s history. Just weeks later, the Thomas Fire flared up on Dec. 4 and quickly became “among the top five largest fires in California history,” NPR’s Kirk Siegler reported a week later. The wildfire was 60 percent contained as of Dec. 20, and had already consumed 272,000 acres and destroyed more than 1,000 structures, according to the California Department of Forestry and Fire Protection. 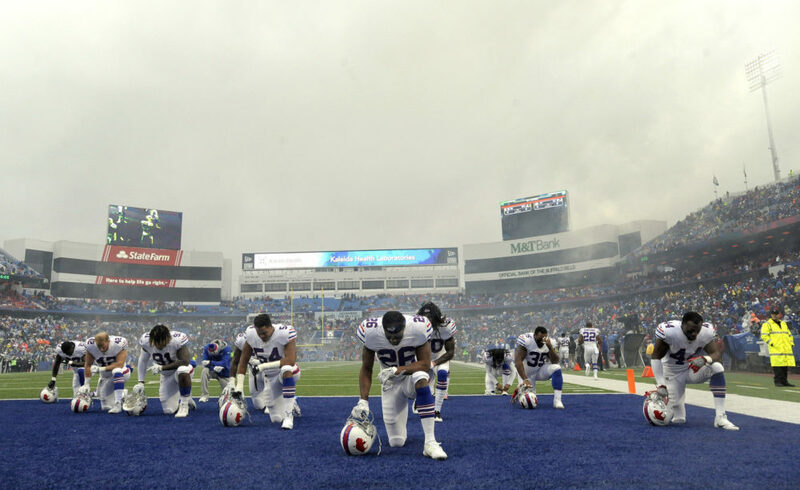 Buffalo Bills players take a moment to themselves prior to an NFL football game in Orchard Park, N.Y., on Oct. 29. It started in 2016 with Colin Kaepernick, the San Francisco 49ers quarterback who decided to kneel as the national anthem played before NFL games, in protest of police brutality. This sparked outrage among some who accused him of being anti-American and anti-military. Kaepernick left the 49ers and became a free agent. He later filed a grievance against NFL players, accusing them of colluding to shut him out of the league over his national anthem protests. When the 2017 NFL season began other players followed Kaepernick’s example, angering some fans and prompting President Trump to suggest that NFL owners should fire players who kneel in protest. This started a conversation about whether NFL owners could discipline players over the protests. Current NFL policy says players “should” stand during the anthem but some have suggested changing it to “must.” But when the owners and players had their annual meeting in October, the protests didn’t come up. 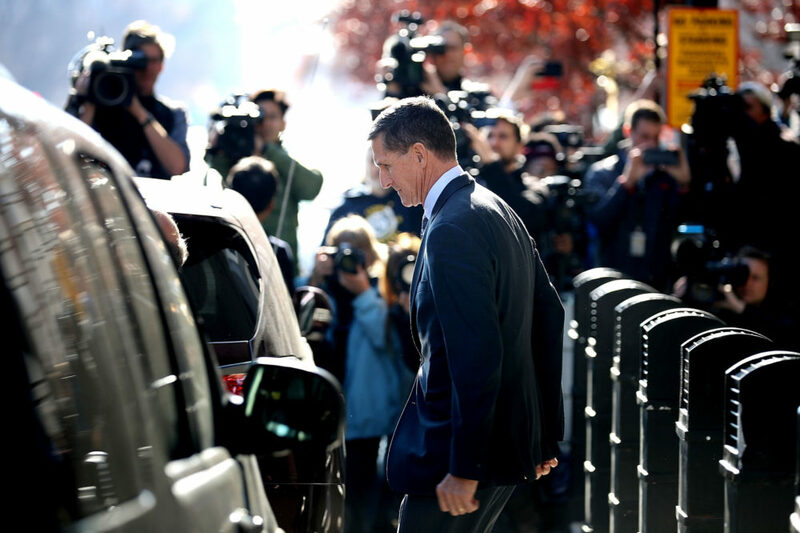 Michael Flynn, former national security adviser to President Donald Trump, leaves the federal courthouse in Washington, D.C., on Dec. 1 after pleading guilty to lying to the FBI. In May, former FBI Director Robert Mueller was given a new high-profile, high-pressure assignment — as the special counsel responsible for the government’s investigation into Russian meddling in the 2016 presidential election, and the possibility that members of the Trump campaign might have been involved. He and his team of lawyers have been digging into those questions ever since, as political feuds erupt on Capitol Hill over Mueller’s actions and the future of his investigation.